What is driving this and is it a bubble? ECB President Mario Draghi’s promise to do “whatever it takes” to protect the euro combined with the unlimited bond buying policy of Outright Monetary Transactions (OMT) has driven borrowing costs down since mid-2012. This effect has been amplified by the expectations of further ECB easing, particularly some form of Quantitative Easing (QE), which would bring yields down even more. There has been some success in terms of eurozone reform, particularly with the successful end to the Irish and Portuguese bailouts as well as these countries’ return to the markets, along with Greece. The eventual agreement on banking union and other aspects of trying to correct the structural flaws in the euro (although I believe it is far short of what is needed) has also contributed to the positive sentiment. Possibly the most important factor though is the very low inflation in the eurozone (and even deflation in some countries). 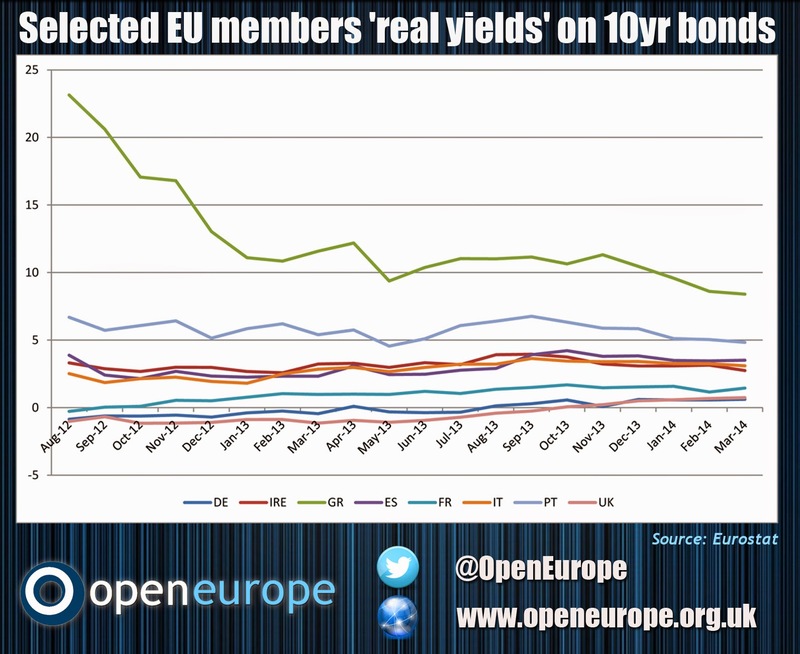 Over the past six months this has pulled the borrowing costs across the eurozone down. This final point is driven home by looking at the rough and ready version of the ‘real yield’ on ten year debt in Europe (10yr yield minus HICP inflation). As the graph below highlights*, when this is done the UK actually borrows at a real rate which is 2% below Ireland’s. While the process of collapsing bond yields in peripheral Europe is explainable it does still present some serious causes for concern. The huge demand for peripheral bonds does seem to have gone too far with respect to the economic fundamentals of these countries. Debt levels have continued to rise – exacerbated by low inflation – while many countries are barely posting any economic growth. More concerning though is that this creates very perverse incentives. Many governments can already be seen professing the success of their policies, citing falling borrowing costs and buoyant financial markets. In reality, these are much more down to the ECB and inflation effects mentioned above. The risk is that complacency seeps in (some of which can already be seen) and that the reform process in these countries stalls. Italy and France are prime examples of this. While the European Commission does have additional powers now to encourage further reform, when push comes to shove there is little it can do to force reform on an unwilling political class and population, particularly one with low borrowing costs. As detailed here, the banking union looks insufficient to break the sovereign banking loop in the eurozone. The efforts to improve the structure of the eurozone have slowed, the risk is they will grind to a halt until the threat of a crisis returns. The performance also looks strange relative to countries such as the US and UK which have always borrowed in their own currency for which they are solely responsible and have clear fiscal and central bank backing. Even with the changes to the euro structure and the ECB promises it’s hard to say that, in another crisis, the same issue wouldn’t arise with regards to a comprehensive lender of last resort (let’s not forget, the OMT comes with plenty of conditions and is limited in scope). Even though accounting for the inflation impact, the difference in risk between peripheral eurozone countries and the likes of the US and UK does seem to be being underestimated. Ultimately, the crisis highlighted that too much price convergence without economic convergence and reform in the eurozone can actually be a bad thing, with resulting perverse incentives and negative outcomes. While the price action in peripheral bonds might not yet count as a ‘bubble’, investors and politicians would do well to remember these lessons when interpreting the record low borrowing costs.